Hanoi-the capital of Vietnam, is a rich cultural city with a history that goes back at least 1000 years although it had had inhabitants long before that. In 1010 Ly Thai To King had recognized Hanoi or Thang Long (Ascending Dragon) as the capital of Vietnam, a status which has remained till today. Hanoi had gone by a number of different names before it had the permanent name as called nowadays. Some of them are Thang Long, Dong Do, Dong Kinh, etc. The name was changed under different dynasty. Located on the bank of Red River, Hanoi still maintains trace of the rivers that run through it last time in the form of famous lakes such as Ho Guom (Sword Lake), Ho Tay (West Lake), Ho Thien Quang (Halair/Halais Lake), Truc Bach Lake, Bay Mau Lake (Seven Hectare Lake), Thu Le Lake (in the Thu Le Zoo) to name just a few. Hence sometimes people refer to Hanoi as the “City of Lakes”. After expanding its administrative area in 2008, Hanoi now is one of the most largest capital cities in the world with the toal area of over 3,530 km2. Hanoi is famous for its distinctive cuisine and is considered home to a lot of traditional Vietnamese foods, such as Pho. Since the early of 20th century, Pho Thin, Pho Giang, Pho Long My have been famous and were sold on the street. Nowadays, Pho has come the special dish of Hanoi and is served in the eateries at the street corners or in the luxurious restaurants. Pho in Hanoi has a special taste that cannot be duplicated elsewhere. This dish is also listed as one of top 5 streetfood in the world by global post. Did you know that Hanoi is the cheapest city in the world for hotel stay and taxi transport According to TripIndex by TripAdvisor? 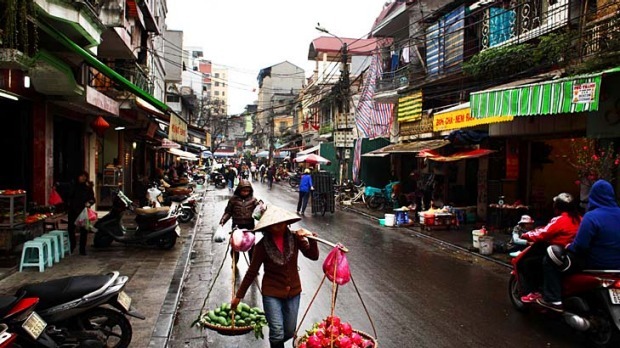 Not long ago, Hanoi is ranked 14 in TripAdvisor’s list of top 25 destinations Asia (by travellers’ choice). 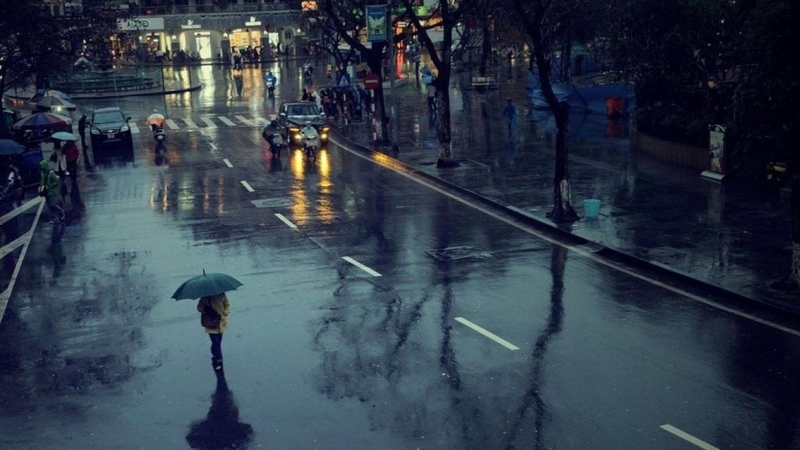 Night life in Hanoi is divided into two categories. One is for those who like to explore the night market and the delicious Vietnamese food that are abundant at these places. Another is for those who prefer to chill out a local bar or club for some local nightlife experience. The Old Quarter, near Hoàn Kiếm Lake, has the original street layout and architecture of old Hanoi. At the beginning of the 20th century the city consisted of only about 36 streets, most of which are now part of the old quarter. It has become one of the most popular attractions in Hanoi for tourists because they can witness the combination of old and modern beauty of Hanoi here and can enjoy various kinds of shopping as well as a lot of local specialties. 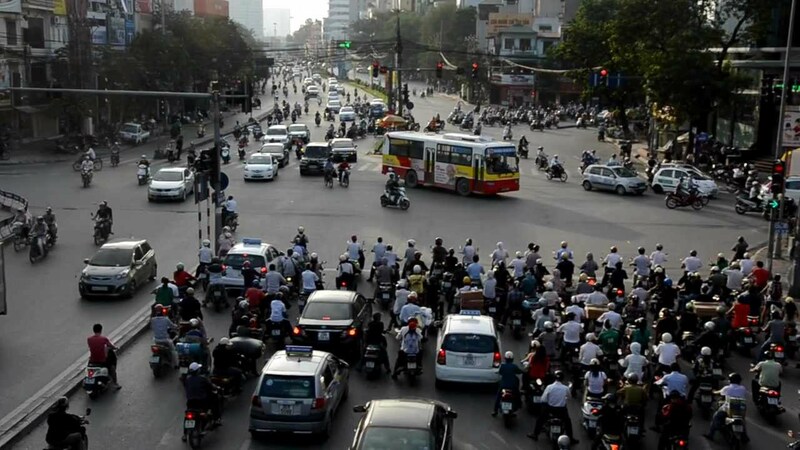 Hanoi epic traffic chaos during "rush hour"
The most popular means of transport here is motorbike. More especially, they even have taxi motorbikes, which are called “xe ôm” (literally means “hug motorbike”). The service does not go with fixed charge, it is customary to negotiate a proper price with “xe om” riders before taking a trip. Hanoi has the highest Human Development Index among the cities in Vietnam. According to a recent ranking byPricewaterhouseCoopers, Hanoi will be the fastest growing city in the world in term of GDP growth from 2008 to 2025. Poetry, songs and literature will tell you that the best time to visit Hanoi is during fall (September to December) and spring (March to May) as these are the two most beautiful seasons in this city when the weather is cool. A trip to Hanoi would not be complete if one does not come to visit Temple of Literature located at Quoc Tu Giam Street. This is the oldest University (1070) in Vietnam where you can see many stelae (turtle stones) carved with “doctorate” degree holders’ name and their hometown.